Folding utility wagons are becoming a popular accessory for the home gardener as, although wheelbarrows can be used to move most gardening items around the yard, a folding utility wagon can also be used for the same thing but also for many other different purposes too. 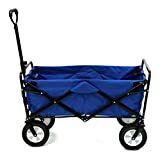 Utility wagons are designed to fold up like an umbrella or portable deck chair, making them easy to store and transport in the back of a car until needed when you get to the desired location. This also makes them very handy for taking camping, to sporting events, to the beach or family picnics, or to other outdoor events where you might like to take quite a bit of gear with you without having to carry it all. They’re particularly useful for heavy items such as coolers / chilly bins and other large sporting equipment. 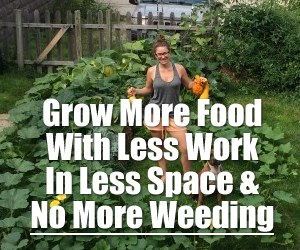 You would be unlikely to use a wheelbarrow in such scenarios, and on the flip side, although not designed to be filled with actual soil like a wheelbarrow might, a folding utility wagon can prove to be very handy around the garden to move heavy bags of potting soil, plants, seedlings and pots, and other garden tools to get them to the location where you’ll be working. Given the many different uses, they make an ideal gift for a family, especially with young children, and also for elderly gardeners that might like the option to have another transport device on-hand, rather than dealing with a cumbersome wheelbarrow. Most folding wagons are made from heavy duty polyester fabric, similar to what backpacks are made from, only thicker and therefore able to hold more overall weight. Their prices usually differ due to the different size options available and / or the grade of fabric, where larger wagons obviously require more materials to make, and heavy duty wagons thicker fabric. Other than that, slight variations might include a few additional features like convenient cup or bottle holders, or larger / wider wheels so they can still be used on softer ground such as on sand down at the beach. 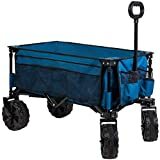 They can generally accommodate most gear someone would want to transport in a single trip, with most being designed to handle up to 150 pounds / 65kgs in total weight – which is pretty good for a portable, folding wagon. The MAC Sports Outdoor Utility Wagon is one of the best selling (and highest rated) folding wagons currently on the market. It has more than 5,000 customer reviews, with more than 80% of those customers giving it a 5 out of 5 star rating for satisfaction (4.6 / 5 overall rating). 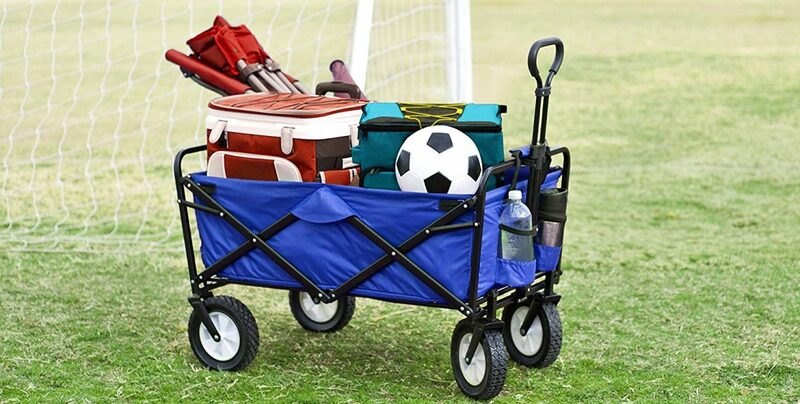 The wagon can be folded out (and also folds away) in just a couple of seconds and has a carrying capacity of 35.5″ x 20″ x 22.5″ making it roomy enough to carry most gear. It is made from a heavy duty 600 Denier polyester fabric and the heavy duty steel frame allows you to carry up to 150 pounds / 65 kgs worth of gear with ease. It also includes two bottle holders for water bottles and an extendable handle which you can adjust for comfort depending on your height, and also to help with maneuverability depending on the terrain you’re using it on. The large rubber wheels have tread allowing it to travel over gravel without any problems. No Assembly Required - Just un-fold and GO! The YSC Folding Utility Wagon is also a very popular choice being a very light weight folding wagon (weighing only slightly more than 10 lbs in total) making it easy to carry from A to B when not being used as an actual wagon. Even though it’s light weight, it also has a decent capacity of 32.7″ x 19.7″ x 20.1″ so you can pack it with quite a bit of gear. The Timber Ridge Folding Camping Wagon is a slightly larger folding wagon with bigger wheels than standard wagons, allowing you to move it more easily on rough surfaces such as gravel or on sand down at the beach. It has a volume of 35.5″L x 18.4″W x 12″H making it roomy enough to pack a lot of gear in. It’s steel frame, and being made from durable 600D polyester material, allows it to support weights of up to 150lbs on hard surfaces and 110lbs on sand or beach. The 8″ large rubber wheels are tapered in the middle for easy of use on hard surfaces, whilst leaving an additional 3.3″ extra wheel width to accommodate all types of terrain including sand. The front wheels rotate whilst the back two wheels are fixed giving you more control when turning.